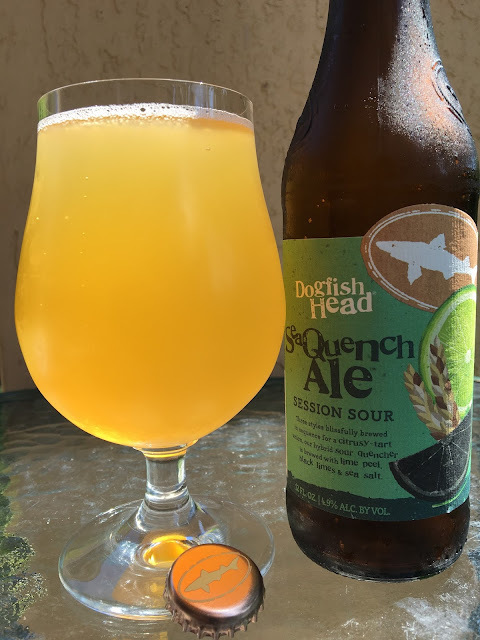 Today I'm checking out Dogfish's SeaQuench Ale, what they are calling a Session Sour. Dogfish also says this is a hybrid sour quencher brewed with lime peel and black limes and sea salt.The label illustrates those ingredients. 4.9% alcohol. Beer Advocate calls this a Gose, if you care. I was trying to figure out what was in my future. Zero head--gose-way in seconds, LOL. Very salty and limey aroma even without putting nose near the glass! Lemon-lime tart flavors to start. Citrus and definitely salty. Very refreshing and barely misses "sour," which was just fine with me. A little different. Simple flavors with a bunch happening. Check it out!